After the dissolution of the East African Currency board into three independent central baks of Kenya Uganda and Tanzania in 1966, each of the three east african countries had their own Shilling. The first Tanzanian Banknotes to be released by the Bank of Tanzania were also in denominations of 5, 10, 20 and 100 Tz. Shillings. The front face had the picture of President Julius Nyerere while the back face had various Tanzanian features. The 5 Shilling banknote had a picture of Mount Kilimanjaro; the 10 Shillings banknote had a sisal estate; the 20 shilling banknote had a the gread Mwadui Dimand mine; and the 100 hundred shilling had a Maasai herdsman. However, the image of a maasai herdsman was not well recievd by the public as it made them appear as a natural attraction or an economic center. Therefore the next release of these banknotes in 1969 had been redesigned and the maasai image was replaced by the image of wild animals in Serengeti. The banknotes were redesigned and released in 1984 before Nyerere stepped down. The new design was more colorful showing an image of the aging President Nyerere. The 10 Shilling banknote was retired from circulation and a new banknote of 50 Shillings was introduced. The back of the 20 shillings banknote showed various industrial activities, while the back of the 50 Shilling banknote showed a self-help spirit in constructing primary schools. The back of the 100 banknote had an image showing graduation processign and facilities at the university of dar es salaam. This image was intended to show strides made in the are of higher education in the nation. When Nyerere stepped down in 1985 and Mwinyi took over. The new banknotes that were released in 1986 did not change in design, but the image of Nyerere was replaced by that of Mwinyi except on the 100 Shilling note. 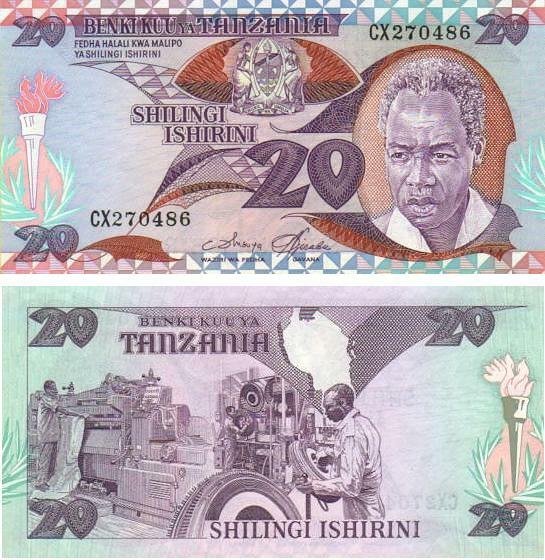 Due to massive delavuation of the shilling that followed under mwinyi, higher denominations became necessary, and a new 200 Shilling banknote was issued. At that time, the 200 shilling was popularly known as the “Double Cabin;” the back of this note had an image showing Zanzibari fishermen and a scribe of clove. By 1988, the demand for more money in circulation forced the bank of Tanzania to release another high denomination banknote of 500 Shillings, known at that time as the “Pajero.” The design of the 500 banknote was quite different from that of the other notes. It had a colored coat of arms and a clear Bank Of Tanzania logo. Its back face had an image of women picking coffee. The shilling continued to deteriolate against the US dollar, hence the demand for more high denomination bankotes contuned to rise. In 1990, a new 1000 Shilling banknote was released. The design of this banknote was similar to the 500 shilling note. Its backface showed Tanganyika Packers plant in Kawe Dar es Salaama as an indication of the industrial activities in Tanzania. Although its coat of arms was not colored, it had a clear BOT logo with a background inscription of 1000. Tanzanian banknoes of that time were rather wide. Towards the end of 1992, major changes happend in the Tanzanian currency. The 20 Shilling note was retired from circulation, while notes of 50, 100, 200, 500 and 100 Shillings were redesigned by reducing their size with slight changes in their apperance. New bankontes of 5000 and 10,000 Shillings were introduced. These notes continued in circulation until 2003 when they were redesigned to add more security features. The girrafe head on the front face was replaced with various popular animals of Tanzania; the image on Nyerere continued to feature the 1000 Shilling note. A new banknote of 2000 Shillings was introducesd. The back faces had pictures of various econom,ic activtities, historical sites and an educational symabol. These notes were written in both English and Swahili instead of swahili alone. These notes are still in circulation today, they are shown in the following pictures. This entry was posted on Monday, September 3rd, 2007 at 8:26 am and is filed under Uncategorized. You can follow any responses to this entry through the RSS 2.0 feed. You can leave a response, or trackback from your own site.